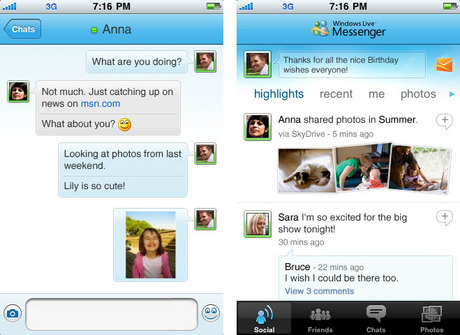 Windows Live Messenger has just released an app for instant messenging on iPhone. It’s free and it adapts lots of the computer-based features for mobile. As with the chat service, the features are better if you’ve got hotmail because the email and chat services integrate. Currently the second most downloaded Free App in the social networking section of the App Store, it’s likely to be a big hit seeing as it will let people communicate for free and across platforms. Previously named MSN messenger, Windows Live Messenger has a huge fan base as it comes with any PC running Windows. Apps channeling it into iPhone have been around for several years, but this is the first official app from Windows. Is there going to be a blackberry app as well? I was excited at first but this app is a complete let down! You can’t change your msn name and the app is also very slow, particularly on the first sign in. I’d say it’s currently the foundations of what has the potential to be a very good app. That’s very disappointing for me, but this app has landed only in certain countries: the UK, Canada and France stores and some others. However, people from Belgium (including myself) and other regions are still able to download just 2 other apps: Seadragon and Tag Reader.